Tokyo Love Shop Retinoic Acid Cream - Tokyo Love Shop Tokyo Love Soap Online Shop. Buy Tokyo Love Soap Original, Girls, Professional/Medicated, Premium, Pure Girls Online. Creams and Gels » Tokyo Love Shop Tokyo Love Soap Online Shop. Buy Tokyo Love Soap Original, Girls, Professional/Medicated, Premium, Pure Girls Online. View cart “Tokyo Love Shop Peel Prep” has been added to your cart. Retinoic Acid is Vitamin A1. Topical Retinoic Acid is always the treatment of choice for mild to moderate acne while oral Retinoic Acid such as Accutane is used for severe acne and acne in cystic forms. Over the counter strength of some Retinoic Acids such as Tretinoin come at 0.05% to 0.1% which is strong enough to combat the common acne. Prescription strength Tokyo Love Shop Retinoic Acid Cream 1% is used for severe acne and acne in cystic forms as well as to prime the skin before skin peeling. Though not required, Priming the skin for 3 to 7 days using 1% Retinoic Acid produces better peeling results. Categories: Peels, Creams and Gels. 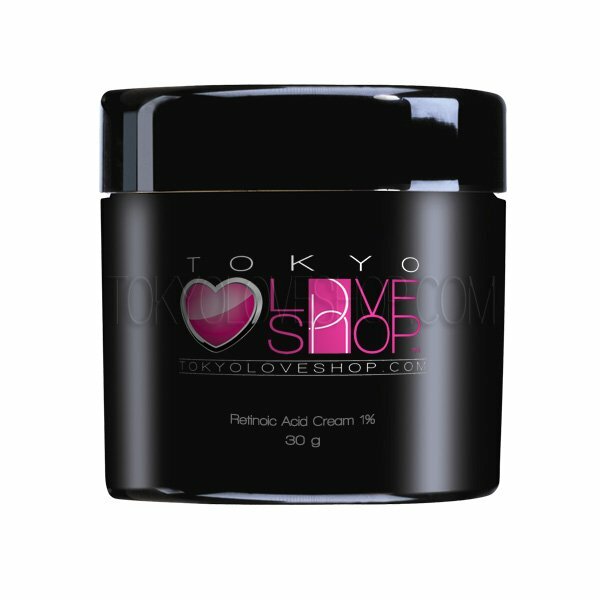 Tokyo Love Shop Retinoic Acid Cream 1% is the perfect priming cream for your peeling needs. Good Surgeons and Dermatologists always recommend Retinoic Acid to be applied atleast 3 days to a week before proceeding to chemical and facial peels. This is to remove soften and remove superficial keratinous skin layers that will hinder peel absorption. So why do we really need to prime the skin? The answer is very simple. The upper skin layer is not even. There are areas that has thicker keratinous layer such as the forehead and the chin. There are areas where the skin is thinner like the areas around the mouth, eyes and the sides of the nose. If you apply a chemical peel, let’s say 30% TCA, The thinner area will absorb more of the peel while the thicker area will absorb less leading to uneven skin peeling. This is the reason why patients who did not undergo priming experience uneven peeling depths and poor results. Tokyo Love Shop Retinoic Acid Cream 1% when applied once a day for 3 consecutive days ensures that the keratin in the upper skin layers are softened and primed for a perfectly even peel distribution and absorption. Though not absolutely necessary, you will experience the best peeling experience if your skin is primed well. Tokyo Love Shop Retinoic Acid Cream 1% is also used as a once a day cream for treatment of moderate to severe acne as well as expulsion of blackheads and whiteheads. 2.Apply Tokyo Love Shop Retinoic Acid Cream 1% once a day before retiring. 3.1 For peel priming: use for 3 consecutive days. 3.2 For acne treatment: use indefinitely for acne treatment and prevention. As with all topical retinoids, improvements are seen after 2 months of use. Works well with any of our Tokyo Love Shop Peels. 10 mg/g of Retinoic Acid in a non-staining water washable cream base consisting of Stearyl Alcohol,Glyceryl Monostearate, Polyoxyl 40 Stearate, Isopropyl Palmitate, Paraffin, Sorbitan Monostearate, Glycerin, Lactic Acid, Deionized Water. I had my daughter try this for her acne and though it takes some time to clear up (1-2 months), it definitely works! I just want to ask though if I can also use it as an anti-wrinkle cream under the eyes. Please let me know. Thanks! thank you! retinoic acid cream is also an anti wrinkle cream but best used all over the face not only on the eye part as it will also make the skin smoother. hi celestine, that is normal. Take note that the more potent it is, the yellowish/greenish it is. This is normal as we altered the formulation. Should I apply the cream all over my face or just on some area where there are acnes? it should be applied all over the face, the goal is not only to treat acne but to prevent acne itself. It work really good. I love this product. Tokyo Love Shops’ Retinoic Acid Cream is Amazing! I’m 19, I’ve tolerated moderate acne for two years, & have extensively tried curing it. I’ve used so many products that didn’t work, however within a few hours of my first use of the Retinoic Cream, my acne had decreased! Within 3 days of applying it 1-2 times (once in the morning, once before bed) my skin was almost entirely clear! This is the best product I’ve ever used for my acne,I’m so glad I tried it because I have beautiful skin again! Thank you Tokyo Love Shop! this is an amazing product. I had some break outs on my chin area and applied this. The following day, the pimples were already almost dried. I didn’t expect that it can work as fast as it does. Amazing! Hi. I have used this cream to reduce my acne and breakouts which i commonly have on my face. Compared to other retinol derived cream, this cream sure give the most promising effect. although the amount is only half of the bottle, but you only need to use a little on the spot. P/s: can i use this cream on my leg skin? i intend to do peeling on my legs, what do u recommend? My daughter will be turning 16 yrs old in sep, she has been using the tls professional for more than a month now, i read in one of the reviews that at that age she should be using this cream first, i noticed her face has lightened but still has acne and now the redness is more obvious, are we doin it right or should we use this first or in combination with the tls professional? bought 1 month ago and I received it after 20 days.. im just wondering how come it came from Singapore though it said it is made in Japan. im living in Japan, but inspite of that I love your product. Its amazing and I just purchased 2 more creams. Thanks a lot. I just used this last night and 2 more days so that i can start using the blue peel. I just used like pea sized amount on my face. When i woke up this morning my face never looks this so good and im so happy cant stop looking at the mirror. Lol! I never had this result with Estee Lauder’s synchronized night repair which is so expensive and ugh i’ve been using it for 6 months already and i never noticed any dramatic results they’ve been gagging about. Cant wait to use the blue peel and some of the products i bought from you as well. Thanks loveshop! I’m using this cream to get rid of my stretch marks. This is my 7th day and I can see my stretch marks are less noticeable! Hope to get really good results after a couple of months using this. Acnes get softened after 3 days use, guess need more time to see real effect. Feeling good so far. Is it okay to use this with TLS Professional soap? I can feel its effectiveness. But quite drying. So must be careful when applying too much. its much cheaper compare to obagi. A must try for every one. Will purchase again. I’ve been using this cream for 3 nights prior to peeling. I think at first it was like opening my pores to let all the whiteheads to come out to the surface. But later, I think there I’ve seen improvement in my skin, especially after washing my face in the morning. My skin feels tight too. It works better using TLS soap and letting it stay on the face for 3 min. I’ve had acne problems for quite a long time now and then after using it for 3 weeks, my face feels smoother now and so far it really helped in lessening acne on my face. Ordered this for my aunt…works for me but will definitely take some time to see good results. It lessened my pimples and will continue using this.So far so good! Im on my 3rd day of using this cream. Haven’t seen any changes yet, but still hoping to have good results after 7days. Can’t wait for this cream to arrive! Have really severe acne – will update again after using. Been using this for over a week now, its great! I had pimples on my nose forehead & chin, now most are dry & gone (just marks), some are still in the drying up process. But it works. At first few days, I thought my skin got worst because of the reddening & dry skin, after some micropeeling, it smoothened my skin. Still have a few more pimples to dry up but this works so far. We’ll see in the next weeks to come. I’ll give an update. Works best with TLS Premium or Ultimate. I’ll be trying TLS Professional with this, placed an order last night. Hope to receive it soon, please ship today? Thanks! Used to prep my peel, feels great. aiv, it should be use once a day every night before sleeping after you washed your face. thank you. used this peeling, it helped for most parts. product is great. used it not only as priming for peeling, also included it in my daily regimen for acne prevention..
wonderful results specially if used for one full week instead of 3 days only. I peeled better after 1 week of RA use then i used blue peel and the effect is amazing. Im done with my face im going to proceed with my back. very helpful for acne and cheap yet solve my acne and whitehead problem my derma did not able to solve. very cheaaap but effective. you sell the cheapeast 1% RA and its the best one I tried. keep up the good work and maintain the quality of your products. Hi guys, this is moonie i dont know if you still remember me but I really like the retinoic acid before my tca peel. can I use it after 7 days instead 3 days? thanks so much!